Replenish the plump, moist skin that has been lost over time with this Hyaluronic Serum. Dry or heated air and sunlight rob skin of moisture and accelerate aging. This serum plumps tissue to reduce the look of lines and wrinkles. 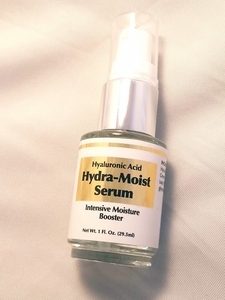 Drinking an adequate amount of water increases this serum's efficiency. Use by itself or apply under creams or makeup.